Alumafloor is commited to making a positive impact on our environment. Alumafloor's product is made from 17.21 percent post-consumer material and 33.5 percent post-industrial Material. In addition to containing 50.56 percent recycled content, at the end of its long life-span Alumafloor is 100 percent recyclable. 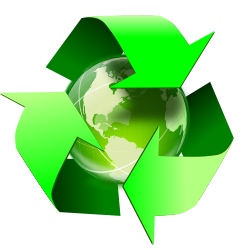 Aluminum building components can also be recycled back into similar products with no loss of quality. Aluminum provides the most valuable component for most municipal recycling efforts. To Produce aluminum from recycled content requires only 5 percent of the energy required to produce aluminum from bauxite ore, and every ton of recycled aluminum saves four tons of bauxite. Additionally, using recycled aluminum instead of raw materials reduces air pollution generation by 95 percent and water pollution by 97 percent.